Media Trove is a company focused on taking new technology and creating innovative new ways to integrate it into our daily lives. We believe that through technology, we can become more connected, more aware, and more engaged with the world around us. With the rapid advancements and ubiquitous availability of powerful, mobile devices we're more excited than ever to be involved in shaping the way people all over the world can experience life. Right now that means helping people to discover and influence the music that's playing around them with our first service, Kanoodl. 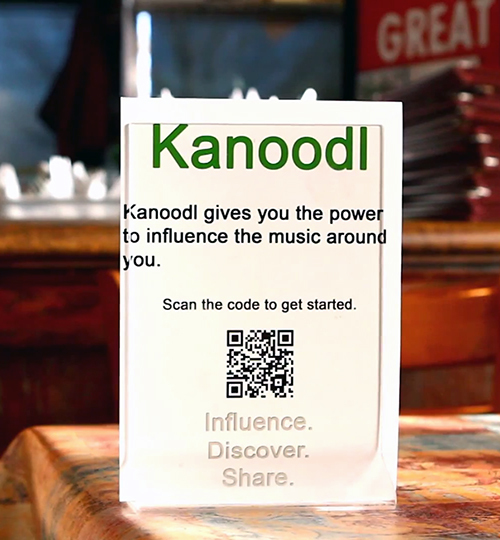 With Kanoodl we enable people to interact with the background music at their favorite businesses, to help them to always have an enjoyable experience, wherever they go and to share that experience with their friends. We also help businesses. With Kanoodl, businesses can connect with their customers on an entirely new level. Not only will a business's customers always be surrounded by great music but that business can start to understand their customers on a personal and emotional level. We're really excited to be working on this service and hopefully many more to come. Thank you so much to all of our customers and supporters for being a part of our vision, we can't do this without you. If you're interested in getting involved we're always looking for passionate and talented people to work with us, as employees, customers, and partners. Feel free to contact us, we look forward to hearing from you!